The DIY Network star's labor of love has hit the market. The North Minneapolis home renovated by TV star Nicole Curtis over several years is finally on the open market. It&apos;ll cost you $425,000 to buy the house at 1522 Hillside Avenue North, which went on the market last week via Keller Williams Integrity Realty. 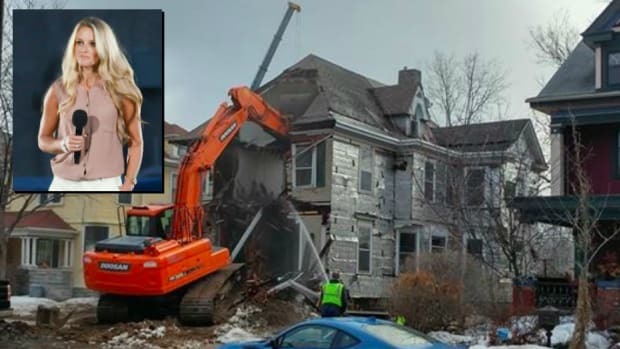 Curtis, who made her name on bringing historic, dilapidated homes back to their former glories through her DIY Network show "Rehab Addict," is named as the listing agent for the property. BMTN asked the Curtis team whether we could share photos of the home in this piece, but never got a response. However you can see them here on the Keller Williams Integrity Realty website. The 1884 property was bought by Curtis in 2013 for $2 from the City of Minneapolis, and what followed was a long-running feud between Curtis and the city over the rehabilitation of the house. Curtis has declared 1522 Hillside will be the last she renovates in Minneapolis as a result, but the work she did carry out on it will make it one of the most sought-after homes in the city&apos;s Northside. The house comprises 5 bedrooms and 2.5 baths across 2,765 square feet of floorspace. The work undertaken by Curtis and her team has saw the wood property taken down to its studs and completely refurbished. It has new HVAC, electrical and plumbing systems, vaulted ceilings, refinished hardwood floors, walk-in closets in the master suite and a tuck-under 2-car garage. As is always the case with Curtis&apos; projects, as many of the original features as possible have been saved for use in the home, including a stunning brick fireplace in the living room. Curtis has said that the future owner of the house will be required to abide by "deed restrictions" when buying it. Here&apos;s what the house looked like before Curtis renovated it. This condo in Saint Anthony Main will set you back $2.2 million. The home has only had 2 owners since it was built in 1951. Its curved porch and stained glass windows also draw the attention. It's undergone an at times contentious renovation by the TV star. The 115-year-old home has a myriad of standout features.